The last three years of Derrick Rose’s career have been utter disasters, largely thanks to issues beyond his own control. Multiple knee and ankle injuries, and a facial fracture in the preseason have battered the body of the one-time MVP and the face of adidas basketball. adidas has marketed hope, the will to come back from injury, and Rose’s quiet resiliency but the fact of the matter is their ambassador has been sitting on the bench for roughly 2/3 of Bulls games since the ’11-’12 season. 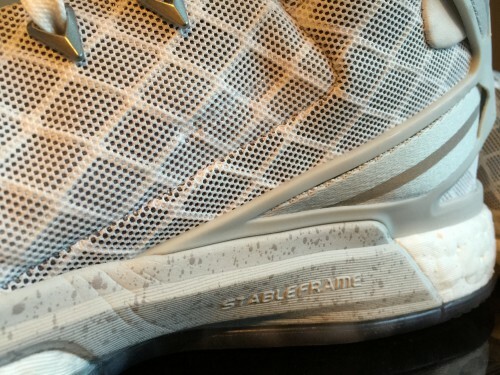 Because of that, Rose signature shoe releases have either been mocked (some recklessly think that his shoes somehow played a role in the injuries) or basically ignored by the sneaker buying community. They haven’t won many over with their aesthetics and Rose hasn’t been on the court enough to create a desire for people to want what he’s wearing. While the adidas folks have been hamstrung in that department, what they have done is create the best performing signature shoe line in the game. People can pan the looks, the use of different materials and some ever changing tech but ever since his TS Supernatural Creator PE, Rose shoes have been absolute monster performers. 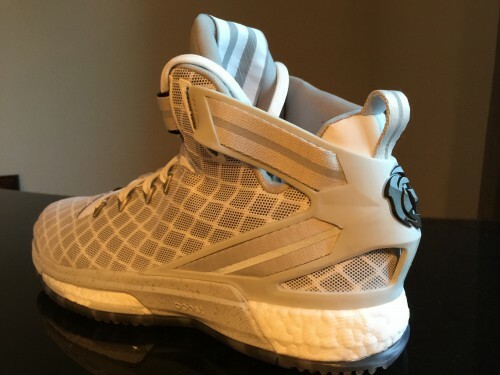 The Rose 6 once again debuted with muted responses and plenty of negativity regarding its looks, but Robbie Fuller and the adidas team may have created the best Rose – maybe the best adidas shoe period – of all time. I went a half size down from my true 11.5 like usual – I always feel like it helps with the fit as long as I can live with the length. I’ve personally loved the fit of the Rose 4.5 and 5, with each providing complete lockdown. The Rose 6 isn’t quite on that level, but it is still very good. The upper on the white pair that I purchased is a kind of mesh overlay on synthetic base (the black colorway is more of a traditional Sprint Web). It’s a nice combo, if simplistic, but it is stiff enough to provide good support and retain flexibility throughout. The upper is also well-padded on the interior and features an interesting liner material on the collar – it’s smooth if you run your finger from top to bottom, but from bottom to top it’s grippy with an almost sandpaper-like sensation (Bryan over at Weartesters did the black colorway and said adidas called the material Cat’s Tongue, which is exactly what it feels like). This gives the liner some friction and helps prevent extra movement within the shoe. Moving the shoe’s most curious design element: that giant heel cage. I initially thought the cage would articulate and tighten when you laced through those top lace loops, but it’s actually fixed in place. The fabric straps will tighten slightly, but the heel portion itself fits pretty snug as is. Lacing is simple and the laces stay in place in the eyelets (some shoes don’t do this and it’s maddening). There’s a nice lace loop on the interior, basically right where the notch is. Lacing through that really locks the top of the foot in and is probably the key piece to that whole upper. Besides that, the loop and strap make up the only other eyelet. This brings that massive tongue into play. It’s extremely comfortable and well padded, but I’ll admit it’s a little awkward at first. It’s really padded because there’d be an uncomfortable amount of ankle pressure from those loops without it, but I will say it keeps me from feeling 100% locked in. I don’t report any side to side or worrisome slippage, but the tongue does give you a little more room around the ankle than you might be used to. It’s the only (extremely minor) negative I have with the upper. The collar, I might add, is probably the most padded and comfortable one I’ve found on a hoops shoe. Two large Boost units plus a midfoot Stable Frame give you buttery transition right out of the box. I can’t stress how quickly these felt broken in. They’re ready to go the second you put them on. As much as I love Micro G and some versions of unlocked Zoom, Boost is the best cushioning platform on the market. 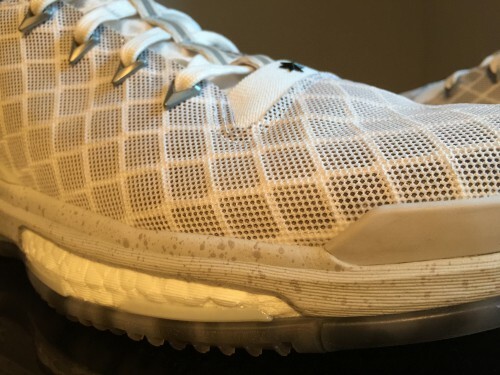 I rock a pair of Energy Boost 2 ATRs almost daily because everything else – even my Flyknit Trainers, Brooks Glycerins and Asics Gel Noosas, all fantastic shoes – can’t match up in terms of sheer comfort. 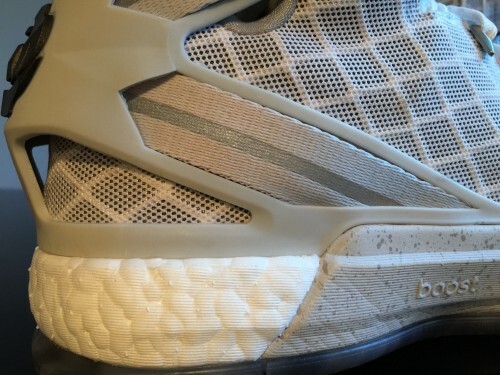 Same goes for this version of Boost in the Rose 6; it’s the most comfortable basketball shoe I’ve put on. Boost volume was increased in the forefoot, and it’s definitely noticeable. The plushness and responsiveness is incredible, but stability is also very good. I felt very connected to the floor and able to move laterally like I wanted to. Sometimes you’ll give up responsiveness and court feel with a soft cushioning platform, but Boost is unlike any other cushioning platform. Another aspect that I loved was the midfoot Stable Frame. It’s a perfect moderating piece between the two Boost units and gives me just the right amount of support through my arches. With 6 years of high school and college ball followed by double reconstructive hip surgeries (swear I’m only 26), my back and lower body are generally in a chronic state of soreness. It’s not a miracle worker or the answer to an injury or anything, but the Rose 6 has been as good as any shoe I’ve recently played in when it comes to supporting me and relieving some of that foot, knee, hip, and back pain. I’ll leave you with this: I love Micro G and I slipped on the Curry 2 after I tried on the Rose 6. But the Curry 2 cushioning felt completely inadequate compared to what I felt in the Rose 6. I have no doubt that the Curry 2 has a great setup and I’d like to review a pair, but the Rose 6 absolutely blew it away on the first impression. adidas nailed the traction setup once again. 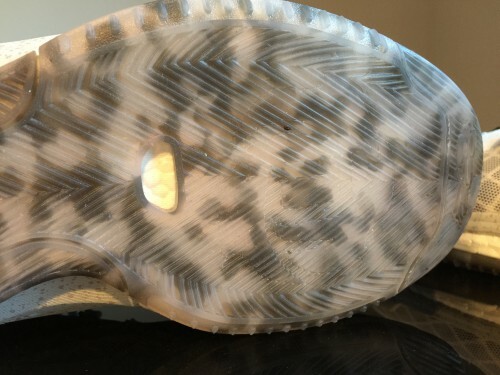 The grooves look a little shallow at first glance, but the outsole grips like crazy. Extremely sticky on every indoor surface I’ve been on – a YMCA court, middle school gym floor, and tile-like church league surface. No qualms from me here. 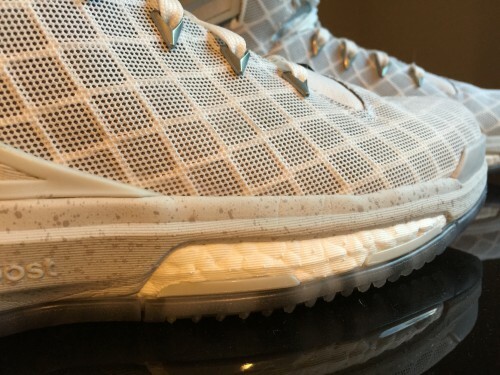 adidas’ overall quality has been excellent in the Rose line and it’s no different on the 6. Everything is well built and put together with no apparent shortcuts in workmanship or materials. Bottom line, this shoe is incredible. The best cushioned basketball shoe I’ve played in, beating out personal favorites in the XX8, TS Supernatural Creator, Zoom BB II and Kobe VI. But it’s better than just Boost – the lockdown, support, and overall package is really, really good. I’ll be playing in these for a long, long time. Great review as always! I agree that this is Adidas’s best shoe of all time. My man! I love seeing your reviews. Been hearing great things about the rose 6 and when you say those good things also; it gets me pumped for them even more. I ended up ordering a custom pair with the 30% off coupon they had going because I didn’t like any of the current colorways. Can’t wait to get them! Keep up the great work man, your reviews will always be my favorite and i hope that one day you can make a living doing this if that’s your desire. I think you’ll like em a lot, just a great all around shoe and I can’t imagine someone having more than minor complaints with any aspect of it. I think the carrier that they place Boost in makes a massive difference in the performance of the shoe – this Stableframe setup is the best they’ve done yet. Appreciate the kind words man, I’ve been kicking around the idea of expanding it again (thanks to a family member’s support) and might try adding some action video if I can get someone to shoot it – while still keeping the detailed review of course. Great review as always Jake — I’ve been rolling with the Curry 2 and original Crazyquick (your review sold me) as of late, but these Rose 6s will be hard to resist, especially hearing that the transition scores high. Court feel and transition with boost have been my only worries with more of it being implemented. Looking forward to giving these a try at some point! The original Crazyquick will always be one of my favorite guard shoes! I talked about it a little with another reader, but the whole key with Boost is the carrier. That frame makes all the difference in the world. Boost is going to feel good underfoot no matter what, but the carrier is what makes it usable for hoops. The Stableframe gives it support, made me feel planted – I agree with you on first glance it looks like it could be bulky and possibly a little unstable laterally. 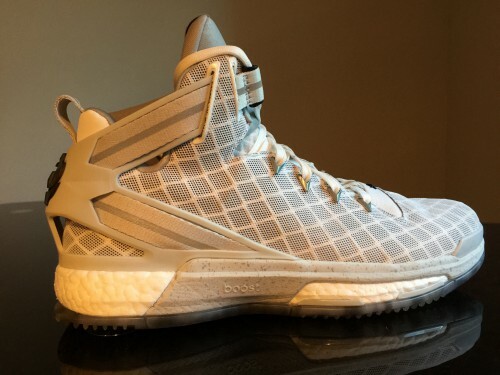 Haven’t like either of the CL Boost setups, but the Rose 5 even had a good one with that X-type piece underneath. Rose 6 setup is even better. The boost in these sound exactly like what I was expecting on the 5. I love everything about the 5 except for the forefoot cushioning. I wish there was a 5/6 hybrid as the lockdown and ankle protection on the 5’s is unreal. I’d probably agree with that – that frame on the 5 was awesome with it wrapping up around the ankle bone. 6 isn’t quite on that level but still very good. I can’t stress enough how good the Boost is on these. Hey jake great review. These seem to be adidas’ masterpiece. I don’t know for sure yet cause I don’t have em but there is no doubt that these would be amazing performers. Will wait for a great cw to come put but the away’s and the balling dead cw’s are seriously good looking. That said though will you be reviewing the j wall 2’s or the cq 3’s? Knowing that you love the fit and puremotion from the cq 1 , the j wall and cq 3 seem to be the only adidas basketball shoe out now that has puremotion. I think that’s a fair statement. These are up there with Supernatural Creators and CQ1 as my favorite adidas shoe, these are pry more comfortable than both. I would like to cop the CQ3 if it goes on sale, I’ve tried it on and liked it initially. A great in depth review, keep it up with the good work! Hands down, this is the best basketball shoe of the year! Thanks man – looking like it so far! Does it feel bulky?Because I have a narrow foot and I am anxious and what do you think about aesthetics? First off, I respect and appreciate your performance reviews as they make choosing a shoe much easier with the information and personal experiences you share. I know everyone has their own style of play but if you were to choose between the d rose 6, Jordan xx9, Kobe 9, or Kobe 10 what would you suggest. Sorry I know that’s a lot of options but I’m stuck on this decision. I play an aggressive 2/3 on court. Traction and cushion are my main concerns. Thanks again! Thanks man, glad you like em! As for those shoes, I can speak to the first 3 better than the Kobe 10 – the 10 I’ve only tried on a few times so I don’t have as good a handle on them. 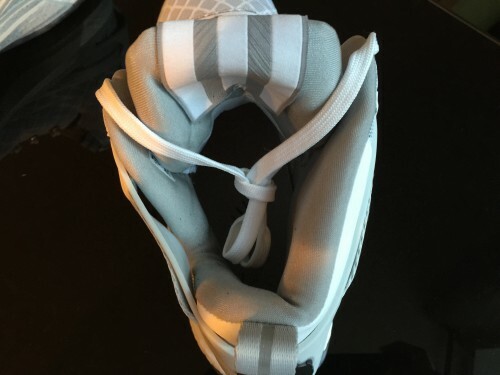 Traction is going to be very good on the Rose 6, XX9, and Kobe 9. The Kobe 9 is probably the softest, most pliable rubber and the sole is really flexible (too flexible for me, didn’t give me enough support) so that’s probably the best one for traction. I don’t think it’s that much better than the other two to swing your decision though. 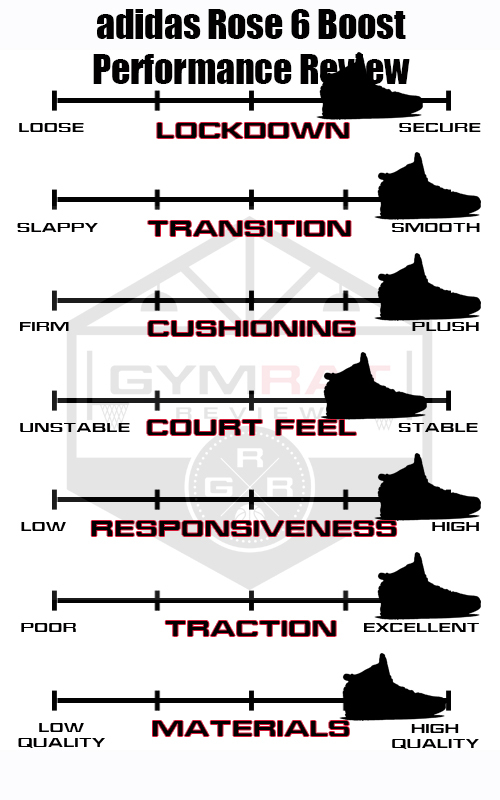 As you can probably tell from my review, I feel the Rose 6 is the best cushioned basketball shoe out there. It’s extremely soft and comfy but has really good support and is bouncy like Boost should be. If you were trying them all on at the same time, I think you’d be stunned at how much better the Rose feels. If you’re looking for a thinner feel and maybe closer to the court, Kobe 9 is the way to go. Very flexible and low to the ground. The XX9 is real good, very stable but I didn’t love the forefoot cushion. Thanks for the quick reply. I’ve been really interested in trying out the Rose 6 just because of all the positive reviews people have been saying about that boost cushion set up; it’s just not a very appealing shoe to me (I’m an all black everything kind of guy) haha. Nonetheless I’ll give it a try in that xeno color-way as it’s the most plain and alright looking choice. I’ll definitely keep you updated on the experience. Thanks again for sharing your knowledge! Sounds good man. I think the looks will grow on you if you find it as comfortable as I did. Good luck! Do you think that the outsole is good to play on outdoors? I’m looking for a nice shoe to play on outdoors, with good/durable traction and good cushion and support. Do you have something to recommend? My only complaints is that there is some type of frame or something in the forefoot that takes away from having pure boost in the forefoot. The shoe is comfy in the heel but for me the forefoot is typical but below what I need. The other is just something I have had a problem with from Adidas is the lack of containment in the forefoot. I think their shoes are better for wide footers. I’m explosive and like to wear double socks and my feet still slide around in the shoe. I’m going to put my Kobe 8 insoles in them to see if I can salvage the shoe. Perhaps other people will love the shoe but for my needs, it was disappointing. I guess they can become outdoor sneaks. Are these suitable on outdoor courts? I’ve hooped in them outdoors but the rubber is very soft so I would suggest not to.